One of the key workspaces in ArcMap is each map document's Home folder, which is the folder location where your map document is stored. The Home folder is used by default in ArcMap to save results, store new datasets, and access file-based information. It is the location that is initially used to add new layers to ArcMap and to store new datasets that are created during editing and geoprocessing. The same is true for nonspatial data. When you export a page layout as PDF, the default location will be the map's home location (the map document's workspace folder). Anytime you copy a map document to a new file folder location, that will become the map's Home folder. You can use this to organize ArcGIS information. For example, a common folder might be used to hold a number of related map documents, in which case they share a common Home folder. You can access the map's Home folder in the Catalog window by clicking the Home button in the Catalog window menu. You can change the Home folder location by clicking the Options button and then the Home Folder tab on the Catalog Options dialog box. Enter the new Home location to be used for all new map documents. Each map document has a default geodatabase, which is the home location for the spatial content of your map. This location is used for adding datasets and for saving resultant datasets created by various editing and geoprocessing operations. For example, when you export features from a layer, the data will be saved in the map's default geodatabase unless specified otherwise. The default geodatabase is synchronized with Current Workspace of Geoprocessing Environments; therefore, all output from tools or models will be saved to this default location. When you create a new map document, you will be prompted to select a default geodatabase. You can set any of your geodatabases as the default geodatabase, provided you have write access. You may have a shared geodatabase that is stored or managed in a DBMS such as SQL Server or Oracle. The default geodatabase can be a file, personal, personal SQL Server, or enterprise geodatabase. You don't have to manually specify a default geodatabase for your document. By default, ArcGIS automatically creates a file geodatabase called Default.gdb in the ArcGIS Home folder. ArcMap, ArcScene, and ArcGlobe will use this geodatabase as the default geodatabase for new documents you create or existing pre-10 documents you open, unless you specify that you want to use a different geodatabase as the default. Access to the default geodatabase is available from the Catalog window menu, and as a shortcut on the Add Data and Save As dialog boxes, so that you can quickly get back to the map's default geodatabase if you have navigated elsewhere in the system. Ensure that you have access. If necessary, for an enterprise geodatabase, establish a database connection. If you want to create a new file geodatabase, you can use the Catalog window to create a new geodatabase that will be your map's default. Navigate to the desired geodatabase in the tree view and click to highlight it. Right-click the geodatabase to see its context menu and click Make Default Geodatabase. The Make Default Geodatabase option is not available on the context menu of geodatabases accessed from the Database Servers node in the Catalog window. To use this functionality, connect to these geodatabases from the Database Connections node . 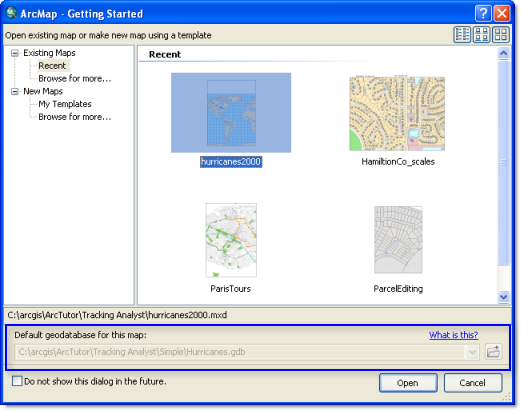 After you have created or opened a map document, you can change the default geodatabase at any time either via the Catalog window (right-click the geodatabase you want to use as the default for your current document and choose Make Default Geodatabase) or via the Map Document Properties dialog box (File > Map Document Properties).